We got our first look at the trailer for "Indiana Jones and the Kingdom of the Crystal Skull" this morning on Good Morning America. The beautiful Quicktime version is now up on Yahoo! Movies and will be in theaters tonight. It's reportedly going to be playing in front of "The Spiderwick Chronicles" this weekend. I don't know about you, but being that "Raiders of the Lost Ark" is my favorite film I'm getting in line right now. If you go to see a movie tonight you may just run into me. I'm the guy carrying the bullwhip. Absolutely great. I love it. Can't wait to see the movie in May. I'm so jealous of Tokyo DisneySEA with their ride being able to have such a cool tie-in. I wonder if the film will bump up the attendance there? I'm with you. 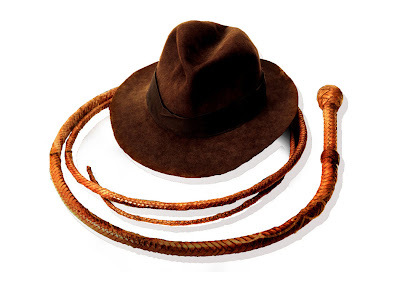 I'm very stoked about a new Indiana Jones movie, and this looks good. I wish the trailer had given us some Karen Allen, tho. Her being back rocks the casbah. Even if it is similar in tone to Crusade, I know I'm going to enjoy the heck out of this film--probably a lot more than I enjoyed the Star Wars Prequels. Yay, Indy! Now if they'd only make a movie about Indiana Jones at the Temple of the Forbidden Eye. Bring it full circle, you know. I've already marked that day for vacation! Wow, very impressed! Looking forward to this! Bring me on some Man with the Whip!